In the Texas Hill Country west of Austin, gnarled oak trees, peach orchards and wineries fill the rolling landscape. 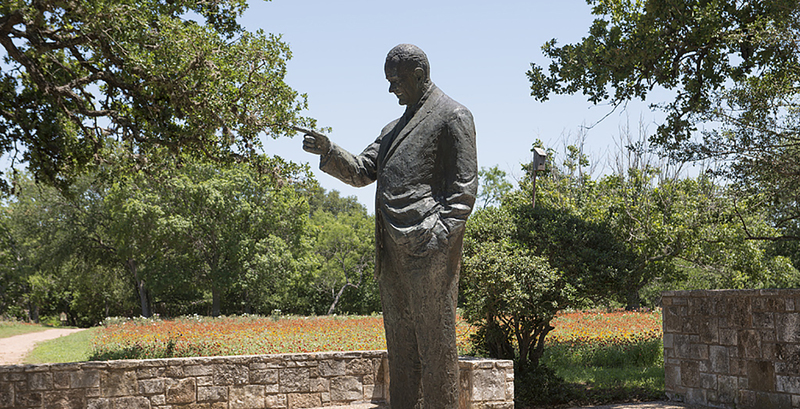 Here, too, along the Pedernales River is the birthplace and burial site of Lyndon B. Johnson, whose upbringing among hardscrabble families stoked his desire to help America’s poor and middle class. “A Great Society" for the American people became the vision for Johnson when he became the 36th U.S. president in an era in which roughly a third of the nation’s older Americans lived in poverty. Within his first years in office, Johnson attained passage of one of the most extensive legislative programs in the nation's history, including the establishment of Medicare, which he signed into law roughly 50 years ago on July 30, 1965. Medicare is the federal health insurance program for people ages 65 and older, regardless of income or medical history, and for people under age 65 with permanent disabilities. Today, it covers more than 54 million people, including more than 3 million Texans. Medicare – along with Medicaid and the Older Americans Act -- stand as lasting tributes to LBJ’s legacy and continue to play an important role in the health and prosperity of the nation. Medicare is an insurance program run by the federal government, Medicaid is an assistance program that serves all ages and is a federal-state partnership. The Older Americans Act, meanwhile, supports a range of home and community-based services, such as meals-on-wheels and other nutrition programs, in-home services, transportation, legal services, elder abuse prevention and caregivers support. As the volunteer state president of AARP Texas, I’m confident that these health programs born in the Johnson administration remain vital for helping Americans maintain their financial and health independence. I’m also proud that AARP and its founder, Ethel Percy Andrus, played an important role in championing health insurance for older Americans and crafting Medicare into a successful program. I’m grateful for their work, as I know firsthand what it was like before these initiative were established. It used to be all-too-common for people over 65 to be left to their own, or solely dependent on their families, for basic medical care. Getting sick meant risking it all: your health, your savings, your financial independence and your dignity. Medicare faces a number of challenges, including the rising cost of health care and a growing aging population. Every day, 10,000 Baby Boomers turn 65. By 2030, Medicare will be serving twice as many people as it did at the turn of this century. AARP believes that there are responsible solutions that will stabilize Medicare for future generations and keep the promise to seniors, including reducing drug companies’ high prices; improving coordination of care and use of technology; and cutting out unnecessary testing, excess paperwork, waste and fraud. Medicare’s golden anniversary is a cause for celebration and reflection, but it is also a time to think ahead about how we can ensure this program continues to fulfill its essential role. AARP is committed to fighting for responsible solutions to keep Medicare strong, not only for today’s retirees but also for our children and grandchildren. Meanwhile, we are urging Congress to reauthorize the Older Americans Act, as it provides a foundation of support that allows Texas to be a great place for older Americans to call home. Since the OAA was enacted in 1965, millions of our most vulnerable older Texans have relied on the services provided by it for their health, economic security, civic engagement and elder justice resources. It was bold leadership by one Texan that led to the creation of these vital programs. But it’s up to all of us today, and the elected officials who serve us, to ensure that they remain strong for future generations. Olivia “Ollie” Besteiro is the AARP Texas state president, a volunteer position.